I have been wanting to start this personal style blog of mine for quite some time now. After being recently married, I thought this would be the perfect time to start documenting my life as a new wife, full time business owner and lover of all things girly and glam. I take pleasure in finding new and pretty ways to live everyday life and I hope you will join me as I share them with you! So my first post has to do with something big that happened to me this year…I got MARRIED! Yes as a wedding photographer for over 6 years now, it was surreal (and weird) to be on the other side! 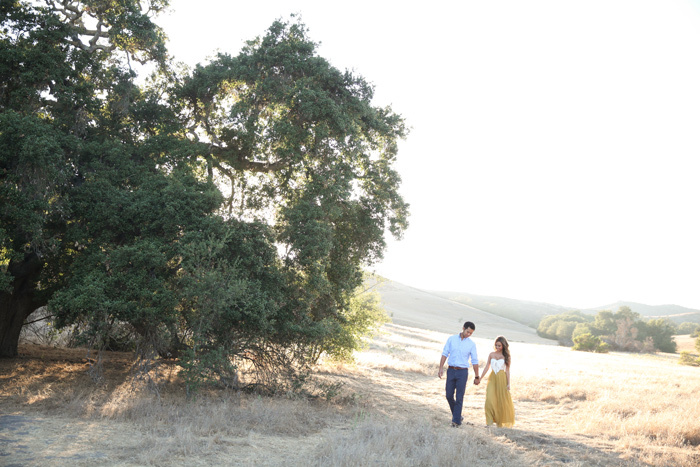 I will be posting several different posts on the big day, including THE DRESS, THE SHOES, etc.. but first I thought I’d share our engagement photos taken by our talented friend, Hanh Nguyen Photography. Honestly, after shooting so many engagement sessions, we were aiming for something different and unique. But wedding planning and wedding season work got the better of us and we didn’t have enough time to put a lot of effort into planning the shoot. So we decide to keep it real simple and just focus on what’s really important…US. And even though we are photographers, we hardly having ANY photos of us together so we were so happy to have these beautiful images captured by Hanh! As both a bride and wedding photographer, I can’t stress how wonderful it is to do a session like this because you really won’t have many opportunities to do photos like this again.